A new preschool star is here! 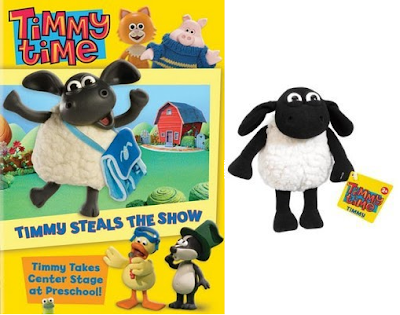 The Oscar®-winning creators of Wallace & Gromit™ and Shaun the Sheep™ show off their all-new preschool play group, with adorable adventures showcasing Timmy and his young friends! Fun, laughter and surprises take center when Timmy performs groovy dance moves and genuine acts of kindness and also learns the true meaning of saying, "I'm sorry." So grab your front row seats for playtime with Timmy and his nursery friends in these lovable tales. 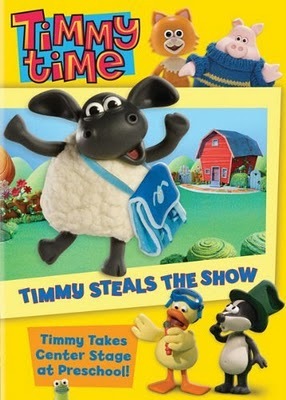 The kids had only had the chance to check out some of the preview clips from Timmy Time on other DVDs that we have, so they were overjoyed to have the opportunity to take a look at Timmy Time: Timmy Steals the Show (Released on DVD yesterday, February 22). The bright colors and adorable character's immediately caught their attention! They watched Timmy and his friends as they showcased their talents, and learned the importance of being kind and good to other's. The delightful character's are young, and like most little one's they make some mistakes along the way and are learning through their experiences. As a parent, I really enjoyed that as they were watching these adorable character's they were learning important lessons. It's good to know that when they sit down to enjoy an episode of Timmy Time that the message that they are receiving is thoughtfully conveying the importance of good values and manners. Timmy Time was a fast favorite in our home! Overall, Timmy Time Steals the Show is an fun and adorable collection of Timmy Time Episodes that will become fast favorites for your little ones!